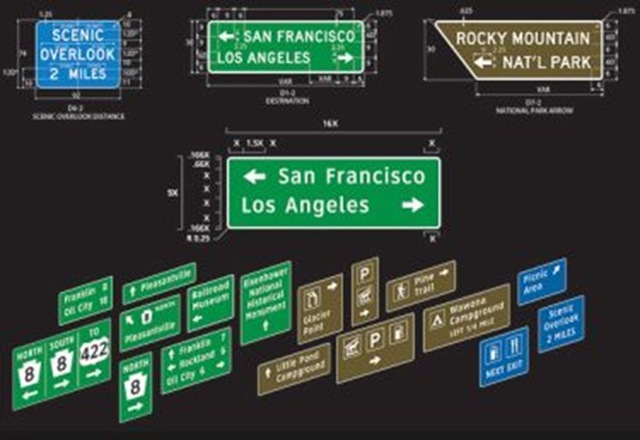 From the usually dependable most emailed list in this day’s NYTimes, a most fascinating story on highway signage. Take a look. The full article includes an interesting slide show (from which the images in this post have been captured), so why not check it out. Remember, though, it’s from the Magazine, so it’s long form, but worthy of your attention. So, it’s about highway signs, but it’s also about one of this writer’s favorite subjects, typography. I’ve always been a collector of interesting fonts, and I’m guessing that there’s a lot of such interest out in the ‘Sphere, since there are a myriad of typography sites, both interest groups and foundries, to be found. I’m imagining that there are many amateurs out there like me, whose Fonts file on their PC is quite full. Just checked, and my C:\Windows\Fonts folder has 249 fonts currently; I’m surmising that there are many, many others tucked away elsewhere, since this sounds like only about half the number I’ve counted in the past (perhaps on one of MUDGE‘s earlier PCs). Can’t possible use that many, ever. And for L-HC, I’ve used a fixed width font (very typewriter like, in case anyone remembers what a typewriter was) called, appropriately, Lucida Sans Typewriter, because it seemed a distinctive choice at the time, when many choices were made. Why is typography such an alluring topic for so many people? Because it’s more than just black letters on a white background. Personality, emotion, connotation. And I thought it was just some designer’s clever new way of looking at something quite old, the 26 letters of our English alphabet. This story is on the Times’ most emailed list because most everyone drives (except of course, in the Manhattan home of the Times! ), and can relate to poorly designed signage. Quick, at 75mph, do I exit for Smithton at the first exit, or the next? There’s glare, is that route 65, or 86? The lonely campaign fought by Meeker and Montalbano for so many years, is a worthy one, no question. Of course, these days, the most pressing issue is going to be examine and FIX ALL OF THOSE GODDAMN BRIDGES ALREADY! This entry was posted on Sunday, August 12th, 2007 at 4:11 pm and is filed under musings, Technology, The 'Sphere. You can follow any responses to this entry through the RSS 2.0 feed. You can leave a response, or trackback from your own site. 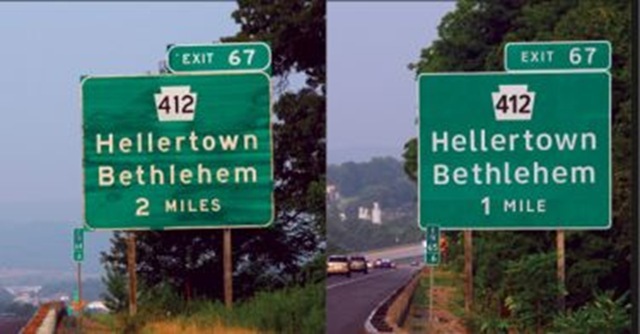 There needs to be more art to our road signs then we currently have. I never could stand the old font, and I’m sorry to say I see little difference in the new font. I’m a fan of matissse Itc and Tempus Sans Itc, but I’m a bit weird. I have seen plenty of Clearview in use in Arkansas and to some extent in Illinois, Kansas, Oklahoma, and to a lesser extent Missouri…and I have not noticed anything different from Highway Gothic, except that it looks rather unusual. What I HAVE noticed, however, is a number of big green signs have lots of wasted green space. What needs to be done, instead of a new font, is make the old font work, by using larger letters and even route markers on the BGS’s. If highway transport agencies would do that they would not need a new font. And yes I agree with you: The bridges absolutely need to be replaced, repaired, and improved. Thanks so much for your insightful observations. Drop by any time! Nice topic and useful information. Great work!